Teaching the Common Core Math Standards with Hands-On Activities, Grades K-2 provides teachers with the help they need to begin teaching to the new standards right away. 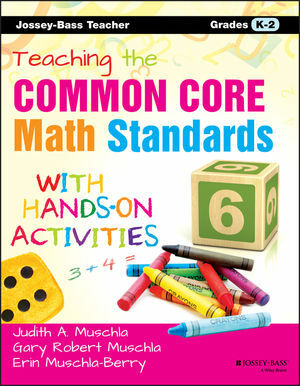 The book outlines the Common Core math standards from kindergarten to second grade, providing one classroom-ready activity for each standard, plus suggestions for variations and extensions for students of different learning styles and abilities. Along with teaching the required mathematical concepts and skills, many of the activities encourage collaboration, technology utilization, written and oral communication, and an appreciation of the significance of mathematics in modern life. Early confidence and success in math is critical to a student's future performance. Math anxiety and a shaky foundation can hinder a student's potential far into the future, giving elementary math teachers a huge role in shaping their students' academic lives. The Common Core has set the bar, and Teaching the Common Core Math Standards with Hands-On Activities, Grades K-2 brings the standards to life. JUDITH A. MUSCHLA has taught mathematics in South River, New Jersey, for over twenty-five years. She has been a member of the state Standards Review Panel for the Mathematics Core Curriculum Content Standards in New Jersey. GARY ROBERT MUSCHLA taught at Appleby School in Spotswood, New Jersey, for more than twenty-five years. Judith and Gary have coauthored many books, including The Algebra Teacher's Activities Kit, Hands-On Math Projects with Real Life Applications, The Math Teacher's Book of Lists, and Math Starters. ERIN MUSCHLA-BERRY teaches 8th grade math at Monroe Township Middle School in Monroe, New Jersey, and has been a coauthor with Judith and Gary on six previous books.